If you haven’t already, you might want to read the first part of this comparison here. 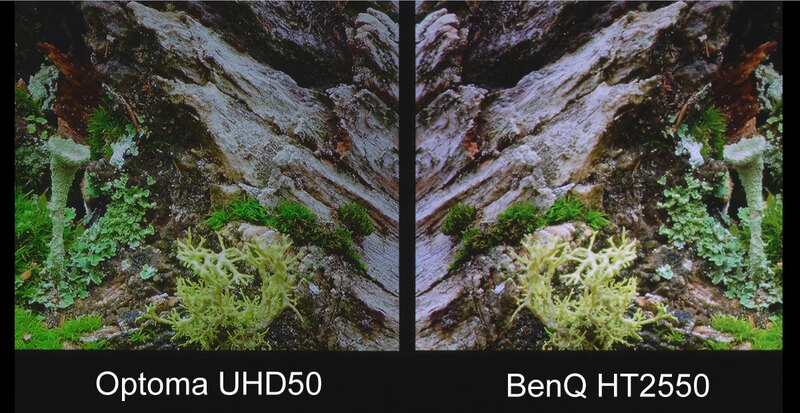 On that post, we went over color gamut, contrast, and black levels comparing the Optoma UHD50 and the BenQ HT2550. In this part, we’re continuing our side-by-side comparison by going over sharpness, detail, and HDR performance. Then, we’re going to share our final conclusions. We began testing sharpness and detail by putting up some test slides from the Extron “Shootout” projection discs from a few years back. This allows us to see how well the up-conversion from 1080p to 4K is doing. At first glace, both seemed to be doing a respectable job, certainly as good or even slightly-better-than most 1080p-only projectors – except for the black levels of higher end projectors, of course. At regular viewing distance of HD sources (usually three to five times image height), the differences at first seem very minor. As we began to look at more images, the differences became more pronounced. 1080p source – at first glance they both seem very close. Click on the image and look closely at the bark and then their eyes and five o clock shadow, there are some differences. This image medium closeup is about 2/3 of each image. The question as to whether a viewer could detect this difference would depend upon two things. One, the viewers eyesight and attention to detail, and two, the distance he or she sat from the screen. At typical HD viewing distances, shown above, there would be some who would and some who would not notice. If, however, that was up-converted from 1080p to 4K at 4K viewing distances, then absolutely most viewers would notice the difference. The image below, which is a close-up of another Extron slide, allows you to see the full difference at close distances. Close-up of 1080p image up-scaled to 4K. At 4K viewing distances most would notice the difference. Click to see the larger image. The differences become even more apparent when we use a native 4K source. Like the up-scaled 1080p above, the differences are more apparent the closer you watch, only now the differences are even more pronounced. In this next image, the screens are shown at about 1/2 of each image so you can see and compare the differences. On 4K, the differences are very real to most viewers, and we did a double check of all factory settings to make sure both projectors were in their middle sharpness settings, and that both projector lenses were at their maximum focus – and they were. Click to see the larger image and the 4K detail and image sharpness differences. You should be able to see significant differences in the red circled areas particularly. We were fully expecting to see about the same detail on both projectors, since they are using the same DLP chip, but we were very surprised to see so much difference. We decided to put a native 4K computer image into both projectors and see if, indeed, they were able to resolve the same amount of detail. Native 4K computer signal fed into both projectors. At HD viewing distance of greater than about 3 times image height, both look reasonably sharp. Notice how small the Windows icons are in the image below. In order to see native 4K, it is important to go into the graphic card display settings and select 100% scaling, as the default on some cards is 250%, which makes the icons and text much more readable at HD distances that most of us are used to. In this case, you can see just how small the icons are, which normally occupy about 1/4 of the screen if they are displayed at their native 4K size. When we want to see the ability of a 4K display we want to see how well it is able to reproduce all 3940 X 2160 pixels. Yes, even these lower cost .47″ DLP chips have the potential to outperform the other pixel shifters from Epson, JVC and others that do not actually put over 8 million pixels on the screen. This image is about the equivalent of being 12 inches from the screen. It then became obvious what the cause of the differences were. It was the lens. Same detail but very different sharpness due to the different lens design and precision. It turns out that that after readjusting the lens again, this was the best it could do. I have since looked up other reviews and several did mention the lens as not being able to focus evenly but we learned that it is never very sharp compared to the competition. 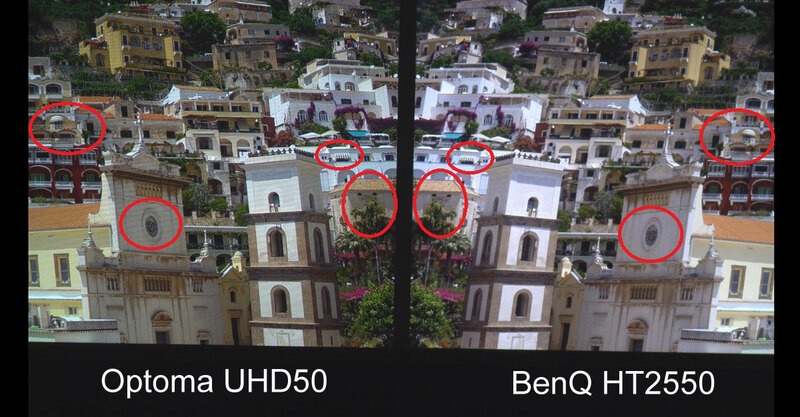 We knew that the actual detail or resolution should be the same since they both use the new TI .47″ DLP chip, but once we saw it in comparison to the Optoma we learned it is simply not the same quality as the lens used in the UHD50, even though they are priced within $100 of each other. It definitely pays off to do side-by-side comparisons. 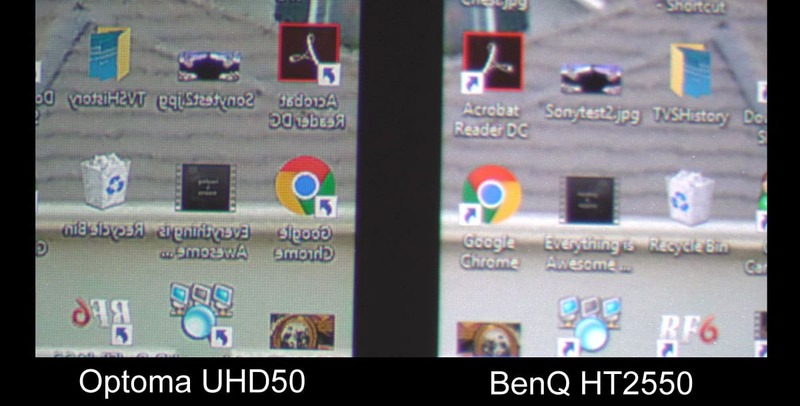 The HT2550 also has slightly less zoom range, as the Optoma has a 1.3X zoom and the BenQ has a 1.2X zoom. Also, the Optoma has some vertical lens shift, but the BenQ has none. This also makes placement very critical for some applications and should be checked to make sure that the projector will work at the desired distance and height. If you look closely at the larger version (click image to see), you will be able to see each individual pixel (fine grid pattern) on the screen. This sharp focus was not possible with the BenQ lens on the sample we received. Until we actually feed some 4K HDR source material into these projectors, we fully expected the BenQ, with its brighter light output, to give the Optoma a run for its money. We were very wrong. HDR brings the very best of all that makes a good picture to the forefront. 4K HDR is not just about dynamic range, it’s about color, detail, contrast, and dynamic range. The real challenge is that there are no standards for how you display HDR, so each manufacturer is on their own as to how they want to use all that information that is now on the 4K HDR discs, including 10-bit color. Since no current product under $100,000 can display all of the REC 2020 color space used in HDR, each manufacturer chooses how they map the colors they do have to the REC2020 color gamut. Then there is the question of dynamic range. Since there are no reasonably priced display products that can do the entire HDR standard, the question also becomes how best to display what the product can do and give the viewer as much dynamic range as possible. In this clip, also from Guardians of the Galaxy II, it is readily apparent what the combination of color, contrast, and detail can do in terms of image quality, and the almost three-dimensional depth that HDR can do. Most commercial theaters (mainly due to costs) do not yet have 4K and HDR. Seeing a movie in HDR can be almost like seeing it for the first time, as there is so much that is in the original image we do not yet get to see in most theaters. What you most likely will not be able to see in these images across the Internet, is how the colors that we see in the expanded DCI P3 color space on the Optoma (80.1% of DCI P3) add to the image quality and original director intent. Unless the monitor you are viewing this on is a wide color gamut monitor (yes, they are more expensive) you will be seeing only a glimpse of the real differences. Professional digital cinema and film cameras have been capturing a far wider color gamut and exposure latitude (up to 16 stops) for many years now. What is exciting for 4K home theater enthusiasts is that we are able to see more of what the original master actually captured and we can enjoy it in our own homes with friends and family. The slightly higher color gamut of the Optoma UHD50 in the DCI P3 color space, better blacks and contrast, combined with a higher quality lens provides the most compelling viewing experience in 4K HDR content. The BenQ with its 3D capability (with optional accessories) utilizes its higher brightness to provide the lowest cost 1080p 3D in a 4K projector. If you are serious about 3D and also HDR performance you may also want to wait a few more weeks until the Optoma UHD51A is released to see if it has the color quality of the UHD50, or if it too will sacrifice color quality for a brighter 3D image. 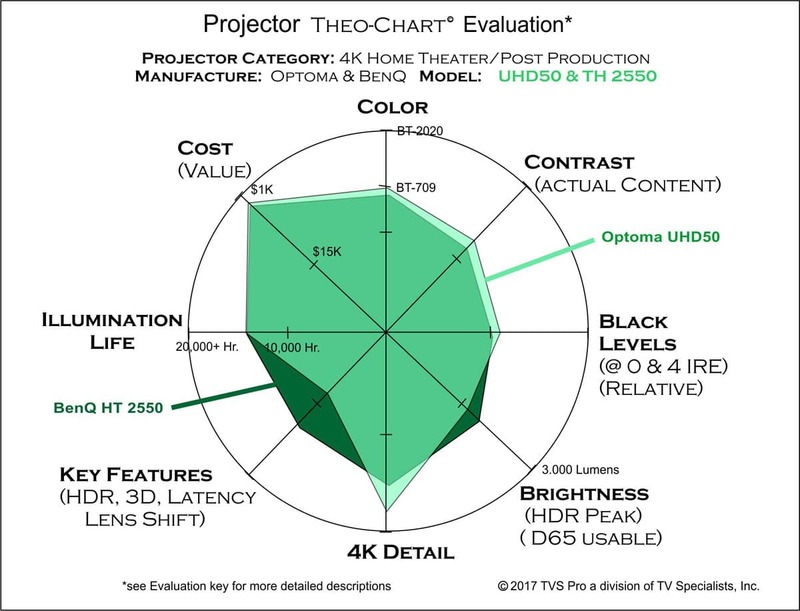 Here is the Theo-Chart that compares both projectors at a glance. As you can see from the above over-layed comparison of the two projectors, a few improvements on the right half of the chart can result in a significant difference in the actual image quality that is not readily apparent from conventional product reviews. This is mainly due to the implementation of the HDR tone mapping, contrast, better black levels, and wider color gamuts. So now you’ve seen and heard what we’ve discovered and what our own opinion is, but what do you think based on the images given? 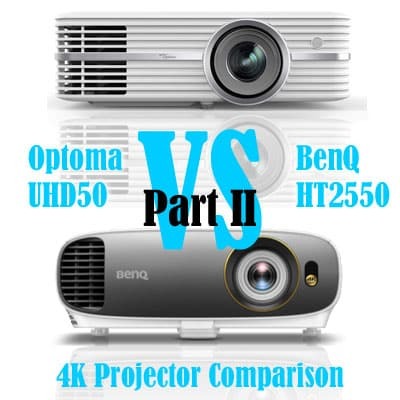 This entry was posted in AV Solutions, Home Theater and tagged 4K Projector Comparison, 4K Projector review, BenQ, BenQ HT2550, detail, HDR, home theater projectors, Optoma, Optoma UHD50, projector comparison, projector reviews, sharpness, UHD50. Ted Bollinger has been in the professional display and electronic imaging industry for over 40 years. He has worked with and consulted with most major manufacturers' engineering representatives of professional and consumer flat screen TVs and projectors. Has has been personally recognized internationally by the Matsushita family (of Matsushita Electric Industries - now Panasonic - and has been recognized nationally by many other companies. He is currently with TVS Pro and serves as the manager for professional display products.